Since Populi is web-based, it's naturally suited to conducting online courses. You can handle everything from disseminating course info (schedule, reading list, deadlines, etc.) to administrating lessons, tests, and discussions completely online. If you're teaching an on-campus course, any number of setups are possible. Some professors simply use Populi to enter final course grades. Others offload repetitive grading items (quizzes and the like) to the online testing features. Yet others focus class time on lectures and discussion and leave all the testing and assignment submission to Populi. Mixed courses—those with on-campus and online students—use Populi to make sure both groups of students have access to all the same materials and so enable them to keep pace with each other. Whatever your setup, Populi courses keep a complete record of everything entered—who was on the roster, who scored well on your tests, what grades your students earned—and plugs the relevant data into your students' permanent academic records. When the registrar sets up the course, she's adding an "instance" of a catalog course to an academic term and filling in certain administrative details. You can see these details on the Course > Info view; some are inherited from the catalog course while others are specific to that course instance. These include things like meeting times, hours/credits, how the course counts towards GPA and degree requirements, and so on. Via the Courses panel or Alerts found on your Home page. Use the course list shown on your Profile > Faculty view or the My Courses view. Click the links provided in the email notifications Populi sends you to alert you to various course events. 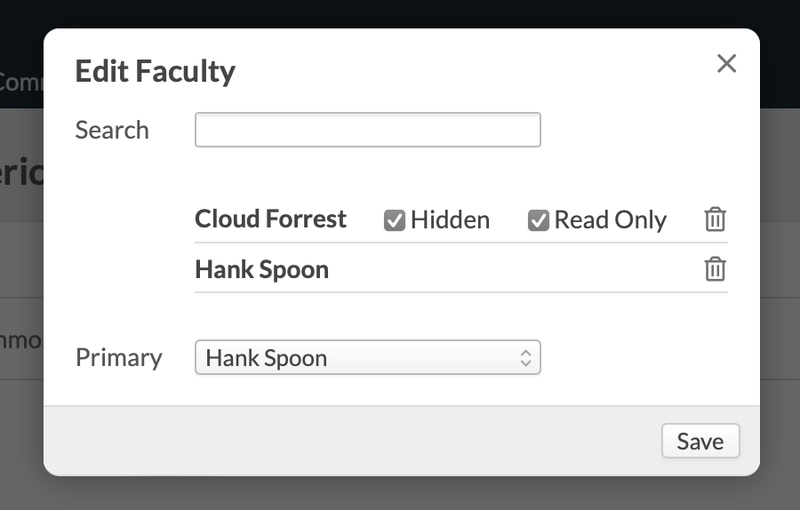 Once you're listed as faculty (and providing you've been granted user access), you can jump right in and start adding content, assignments, files, and other details to your course(s). Sometimes you'll see content already present in the course. These items may have been cloned from a previous term or otherwise added by another user; you're free to modify any of these items. Next, Assignments (and Assignment Groups). Then, Lessons and Tests (tests are created as Assignments, but are designed in the Tests view). You can add or modify course content at any time during your run of the course (up to the point at which you finalize the course). When students start enrolling in the course, you'll see that activity reflected on the Roster. Roster activity may continue throughout the term as students enroll late, withdraw, change to auditor, and so on. While there are settings that can change how these things work, for the most part, enrollment activity is managed by the Registrar. Once the course commences, the students can submit assignments, interact with lessons and discussions, take online tests, and pipe in on chat and the bulletin board. Meanwhile, you'll grade tests and assignments, mark attendance, communicate with your students, and modify course content as needed. You can also monitor student progress and other course statistics on student course summaries and the Performance Dashboard. 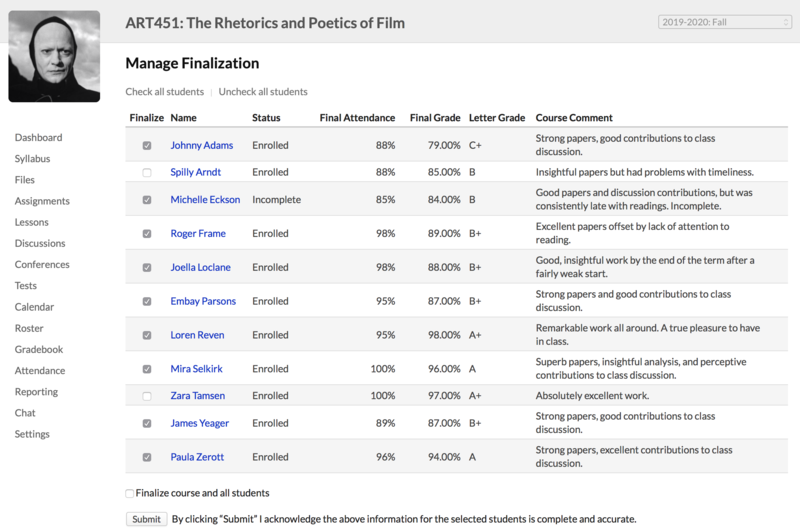 At the end of the Term, you'll review student grades and attendance and then finalize the course. Finalizing submits the grades and comments to the registrar, and commits the course's relevant academic records to each student's grade reports, transcripts, GPA's, degree audits, and so on. After a course is finalized, it is closed to modification to both you and your students. The Registrar can temporarily unfinalize the course if necessary; you can also go back to the course roster and fill in grades for incomplete students. The Dashboard shows the course schedule, links to discussions, and includes a bulletin board that's open to you and all your students. Info is like an electronic syllabus containing the basic information about the course (description, schedule, supplies, reading list, and so on). It also features tools that let you clone/sync course materials, import a Common Cartridge file, and manage finalization. In Assignments, you create and manage assignments and assignment groups. This is also where you take the first step in creating online tests. Lessons lets you create online lessons, which in turn can be connected to particular assignments, tests, and discussions. Discussions lists all of your discussions, which can be course-wide or connected to particular lessons, as well as graded or not-graded. In Tests, you design, review, and grade your online tests. Tests are initially created in Assignments. The course Calendar shows every course event, including due dates, test and lesson availability, holidays, etc. The Roster gives you the basic details about your course's enrollment situation. Student names also link to their student course summary pages, which give you details about student performance and attendance. The Gradebook links to individual assignments, gives you grading tools, takes you to the final grade/attendance page, and lets you manage finalization. Wanna guess what you can do in Attendance? Reporting features the Performance Dashboard, which displays student performance statistics from various perspectives, and the Change Log, which records every course event, small or great.